Easton Peterson (center) with his mother Audra Peterson (left) and teacher Kati Grundey (right). Behind them are two other members of Woodlawn’s preschool teaching team, Emily Ward and Ashley Jeffers. Three-year-old Easton Peterson was enjoying his pancakes and apple slices – until he began choking and gasping. His lips were turning blue when Grundey took charge and applied the Heimlich maneuver to restore Easton’s breathing. 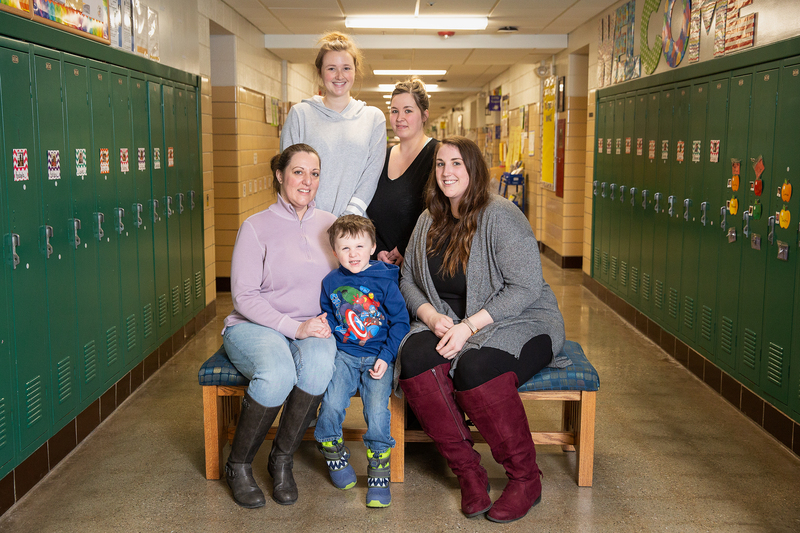 “Teachers never get enough credit,” said Easton’s mom when she called to make sure that Miss Grundey, who she now considers to be “like family,” got her fair share for giving Easton a lifesaving hug. Easton posed for photos with his teacher while sporting a Captain America sweatshirt. Teachers might not be as marketable as fictional superheroes, but the differences they make are real.